The office building as it appeared in the 1880s, with the store building adjoining it at the left rear. Image: Burton Brothers, Hocken Collections S10-221c. The Union Steam Ship Company was a giant of colonial commerce. It became both the largest shipping company in the southern hemisphere and the largest private employer in New Zealand. Established by James Mills in Dunedin in 1875, it grew out of a shipping business started by John Jones and later managed by Mills. By 1882 it operated coastal and inter-colonial shipping routes, with a fleet of twenty-one steamers and a further four on order. At this time its head office was at the corner of Liverpool and Bond streets. 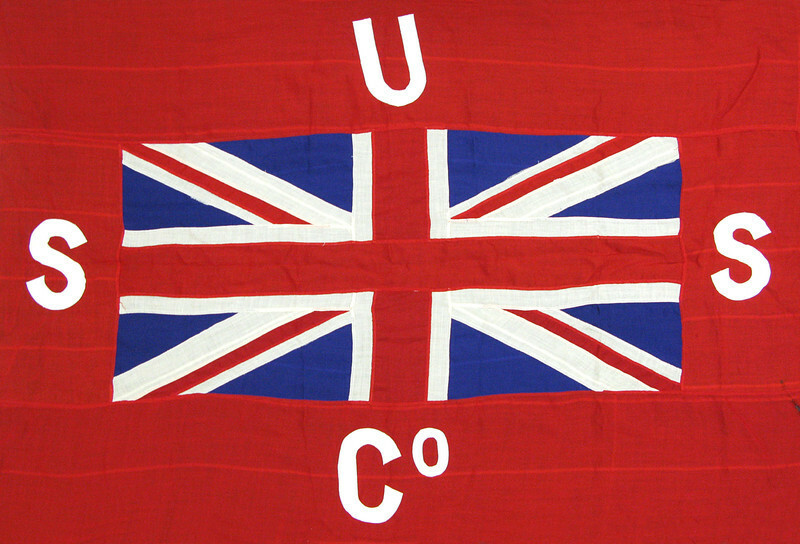 Flag of the Union Steam Ship Company. Image: Museum of Wellington City and Sea 2005.4970.90. In September 1882 the company appointed prominent local architect David Ross to design a new office building and adjoining store, to be built on recently reclaimed Harbour Board land fronting Water Street. The following month the contract for construction was awarded to Bateman & Stait, who submitted the lowest tender of £6,526 (less £375 if minarets and parapets were left off). Although this was a large sum for a Dunedin building, it was modest compared with the cost of a ship. 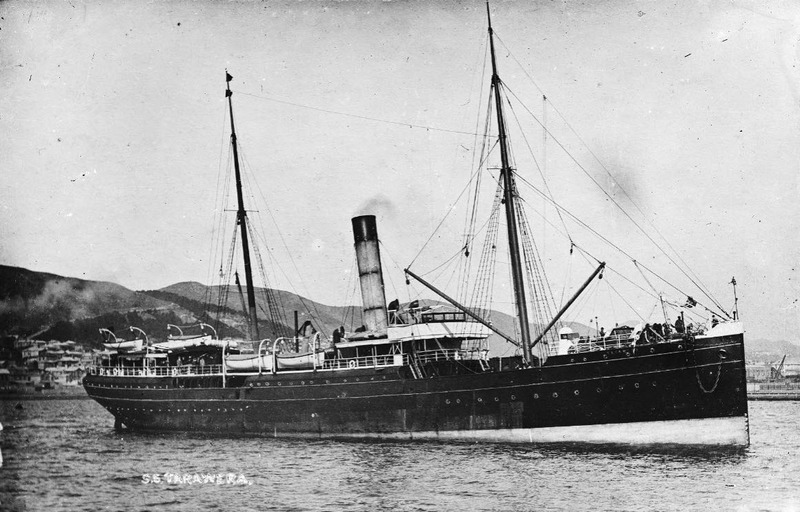 the company’s two largest new ships of 1883 (the Tarawera and the Hauroto) each cost over £60,000. The building project took approximately a year to complete and was finished around November 1883. Detail cropped from Muir & Moodie photograph. Image: Te Papa C.012197. The main building was brick, rendered in cement plaster, with concrete foundations and a half-sunk Port Chalmers stone basement that rose six feet above the footpath. The roof was slate. 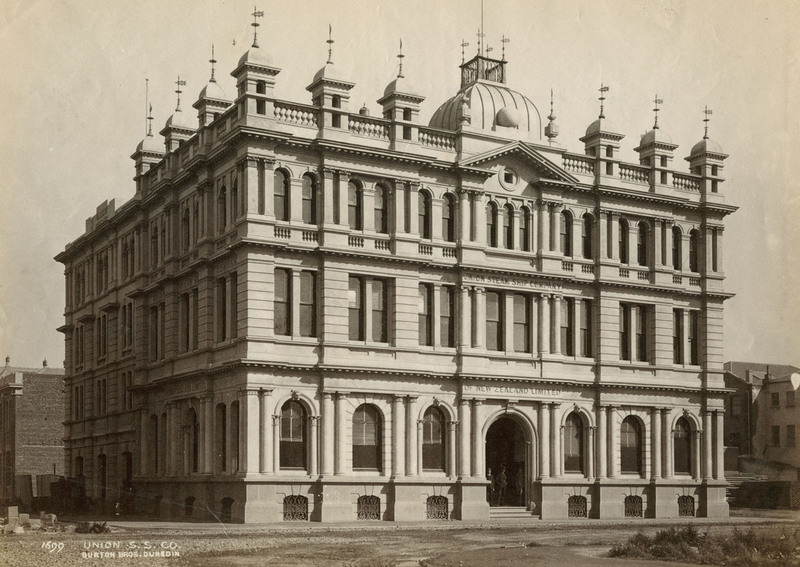 Elaborately decorated elevations were described in the Otago Daily Times as ‘tasteful, although anything but gaudy’, and it was reported that ‘in point of external appearance the structure will not be rivalled by any other of its kind in the city’. The style was essentially Renaissance Revival (‘modern Italian’), but the fanciful roofline featured an array of minarets that probably drew from English Tudor models, and a square-based dome was suggestive of the French Second Empire style. Some proposed decorative details, ‘an emblematic design (globe, anchor, cable &c.) enclosing a clock’, were not finished as intended. Ross had spent time in both France and the United States a few years before, and what he saw there likely influenced the design, which was a departure from his earlier work. While the building was still under construction he won the competition for the design of the Auckland Harbour Board offices with a strikingly similar composition. That looks familiar! 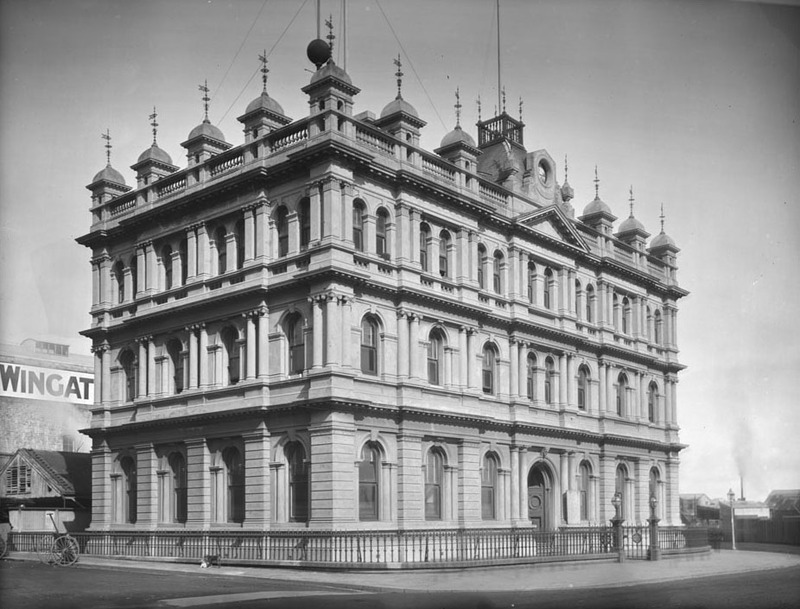 David Ross also designed the Auckland Harbour Board offices in Quay Street, Auckland (1883). Its exterior decoration was removed in 1958 and the building was demolished in 1969. Image: Sir George Grey Special Collections, Auckland Libraries, 1-W890. The neighbouring store building fronting Cumberland Street had a simpler but complementary design and the combined height of its four storeys were the same as the three storeys of the offices. The store included a hydraulic goods lift at one corner and the building reportedly contained ‘every convenience for the reception and despatch of the various materials needed on board the Company’s steamers’. The top storey of the office portion was also initially used as storage space. On the lower floors were counters, desks and other carved timber fittings of polished cedar and walnut. The large shipping hall on the ground floor (22 x 32 feet) featured parquet flooring and handsome cornices, and the vestibule was paved with Minton tiles and had iron gates. On the same level were also a smoking room for visiting ship captains, a reading room (with ‘all the principal Colonial journals’), a telephone room (for that relatively newfangled invention), the Engineer’s Office, and other staff offices. The first floor included the board room, James Mills’ own office, the deputy manager’s office, and the bookkeeping department. Heating was by F.H. Asbury’s low-pressure steam system, and there were also open fireplaces in some rooms. The building remained the head office of the Union Steam Ship Company from 1883 to 1921. 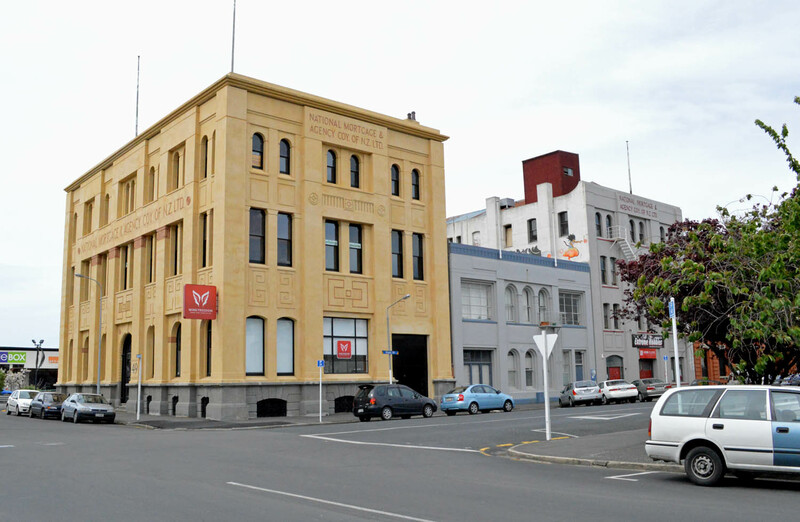 The company’s headquarters then transferred to Wellington and the Water Street building was used by the Dunedin branch office, which only needed the ground floor. Meanwhile, on the corner diagonally opposite, the National Mortgage and Agency Company had outgrown its premises, so in 1929 the Union Company and the NMA came to an arrangement to exchange buildings. The two firms had a long association, and had mutual directors for some years. 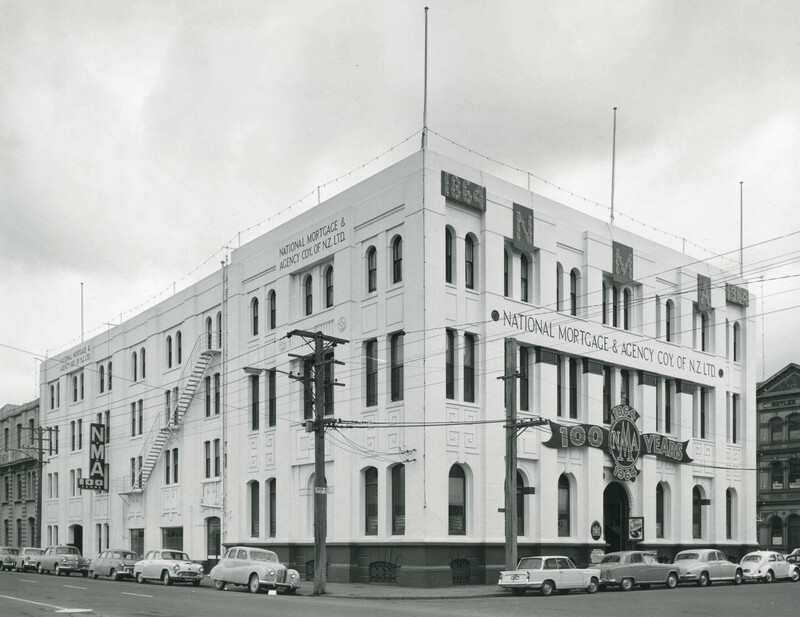 Established in 1864, the NMA was a stock and station company that became the second largest wool broker in New Zealand. The company’s historian, Gordon Parry, described its fortunes in the interwar years: ‘Bemused by topsy-turvy trading conditions and unpredictable price fluctuations, the National Mortgage bounced through the troublesome time of the late 20s and into the threatening 30s rather like one of its staff members following a narrow sheep trail in a poorly sprung runabout’. The outward appearance of the building changed little in its first decade of NMA ownership, the few alterations including new signage and lettering (for example ‘USSCo’ was changed to ‘NMACo’’ on the basement grilles). In 1940, however, it underwent a major transformation. Most of the building’s original exterior decoration was destroyed in remodelling designed by architects Mandeno & Fraser (the specification is initialled Mandeno) and carried out by W.H. Naylor Ltd. Such facelifts were common in Dunedin at the time, influenced by fashion and iconoclasm, and often triggered by maintenance issues such as crumbling masonry. 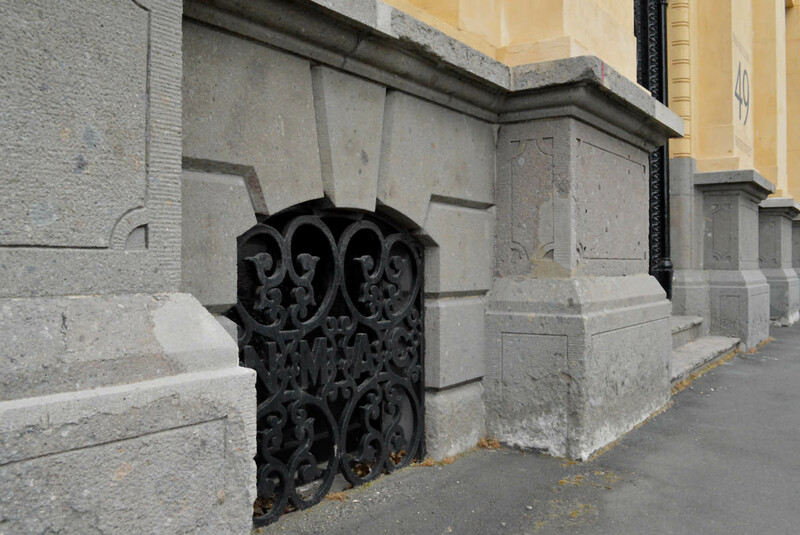 Existing masonry was bolstered back or filled in, and surfaces replastered in a fashionable quasi-Art Deco style, with restrained decoration and contrasting colour effects. The end result didn’t look quite like a twentieth century building, as the overall proportions and most of the windows were unchanged. The stone basement was not altered and the grand entrance doors were also retained. 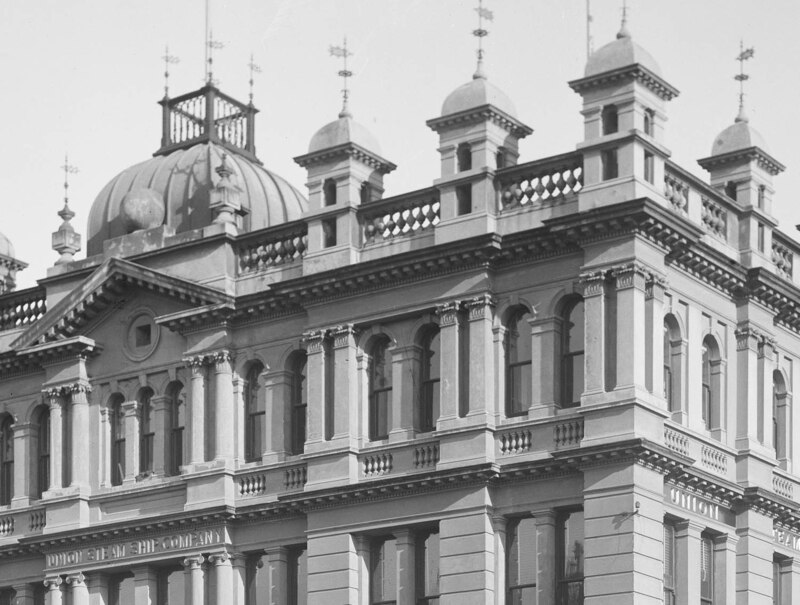 The building at the time of the NMA centennial celebrations in 1964. Image: Hocken Collections S10-221e. The building in 2010, prior to redevelopment. The building in 2013, after redevelopment. 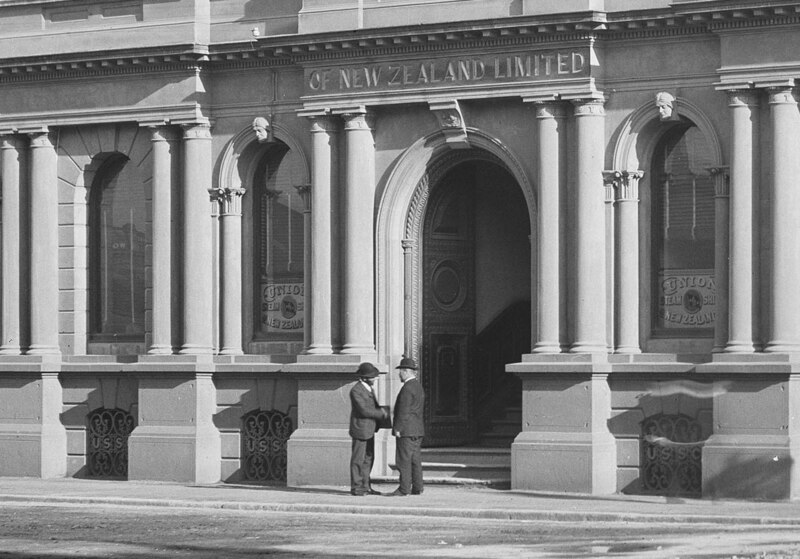 NMA moved its head office to Wellington in 1970 and the Dunedin building became a branch office. The company merged with Wright Stephenson & Co. in 1972 and the new company (Wrightson NMA) vacated the Water Street premises in 1977. The building was renamed Vogel House and during the 1980s and 1990s it was used as a rehearsal venue for bands and other musicians. The Dunedin Sound group The Chills had a space on the south of the first floor and recorded their single Doledrums there in 1984. Other groups that rehearsed in the building included the Kaftans, the Moomins, and Jim’s Live Deer Recovery. The building was later the venue of a two-week squat installation by artist Georgiana Morrison (1995) and the show ‘Dereliction’ by Kim Pieters (1996). Steve Macknight’s NMA Properties Ltd redeveloped the building between 2010 and 2012. The exterior was renovated to approximately its 1940 appearance, one of the exceptions from this being the addition of a slightly incongruous cornice at parapet level. Paint was stripped from the stonework and plasterwork, and the latter was restored to a beautifully warm and complex colouring. Few of the original interior features had survived earlier alterations, however, remnants of plaster cornices and entrance features were retained. Brick walls and roof structures were exposed, making the most of surviving historic fabric. Major earthquake strengthening (to 67% of the new building standard) included new poured concrete floors and tying back of walls. The redevelopment was granted $20,000 from the Dunedin Heritage Fund in 2010 and won the 2013 Dunedin Heritage Re-Use Award. Current tenants include Wine Freedom and Psychology Associates. It is a pity that the building is not the spectacular example of Victorian exuberance it once was, but this in no way diminishes its significance as a rich site of cultural and economic history. 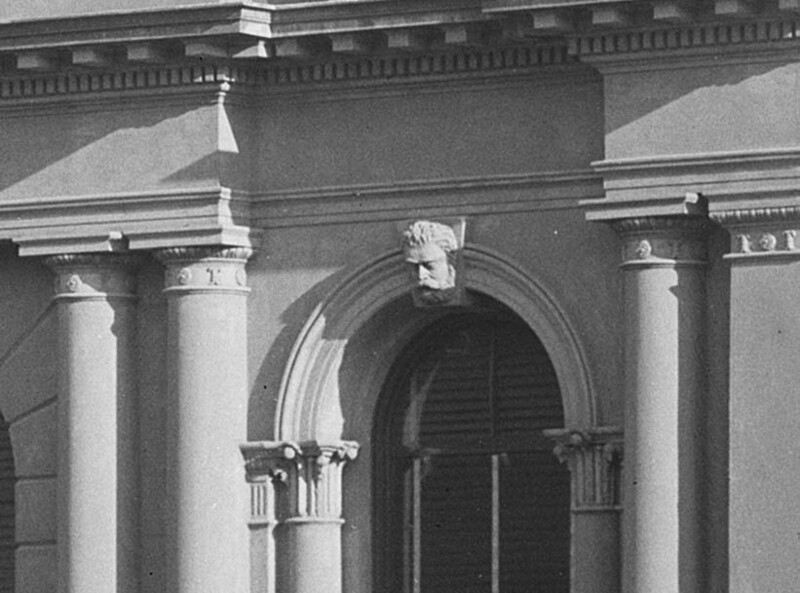 Historian Gavin McLean describes it as ‘New Zealand’s most important office building’. 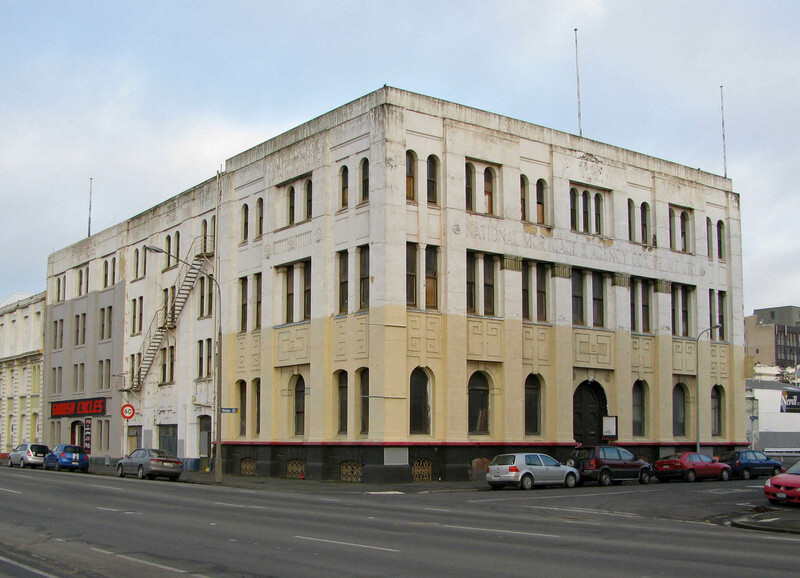 I nominated it as an historic place to the New Zealand Historic Places Trust in 2010 and it is yet to be assessed, but thanks to the work of enthusiastic local developers its future looks good, and it is once more an attractive and widely appreciated part of Dunedin’s Warehouse Precinct. 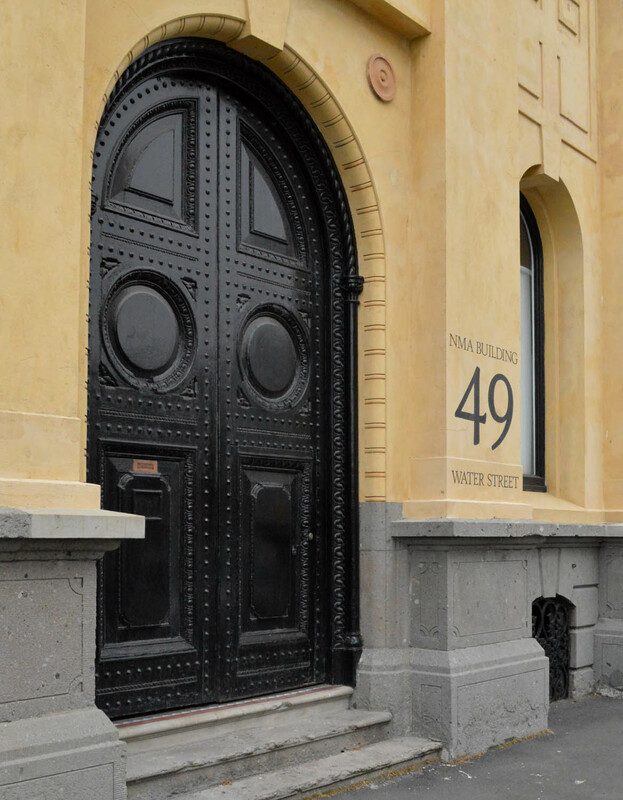 The main entrance, including original doors. Original basement stonework and grille. Otago Daily Times, 10 September 1883 p.4 (description), 28 July 1977 p.11-18 (removal of Wrightson NMA); Evening Post (Wellington), 6 March 1929 p.8 (building exchange). Baré, Robert. City of Dunedin Block Plans (Dunedin: Caxton Steam Printing Company, 1889). ‘A Citizen’ [John Bathgate]. An Illustrated Guide to Dunedin and its Industries (Dunedin: Fergusson & Mitchell, 1883), pp.140-142. McLean, Gavin. 100 Historic Places in New Zealand (Auckland: Hodder Moa Beckett, 2002), pp.122-123. Parry, Gordon. 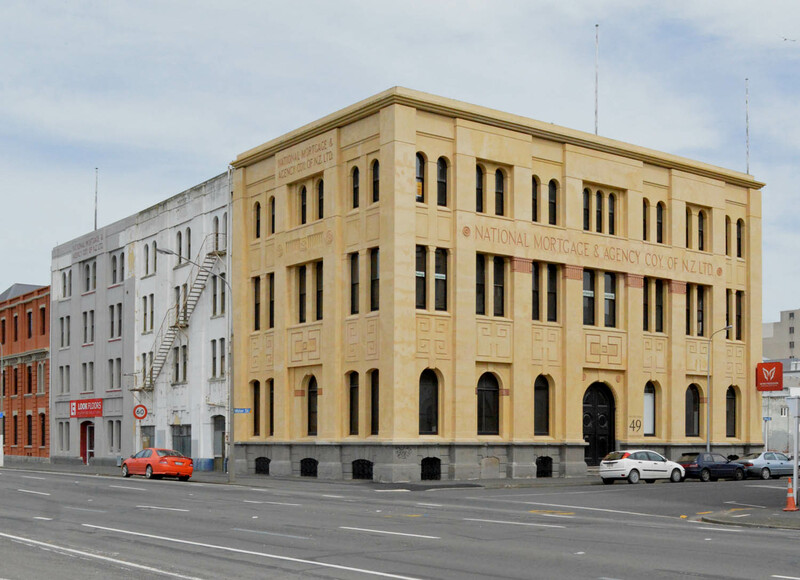 NMA: The story of the first 100 years: The National Mortgage and Agency Company of New Zealand Ltd 1864-1964 (London and Dunedin: NMA. 1964). Information about band rehearsals in the building supplied by James Dignan. View across the intersection of Water and Vogel streets. This entry was posted in Buildings and tagged 1880s, 1940s, Art deco, Baitman & Stait, Cumberland Street, David Ross, Facelifts, Mandeno & Fraser, Renaissance revival, Ships and shipping, Union Steam Ship Company, Victorian, Vogel Street, Warehouse Precinct, Water Street on 19 December 2013 by David Murray.